URLs are one of the most basic SEO techniques used. A well-configured URL structure can significantly impact the visibility of your site or page. 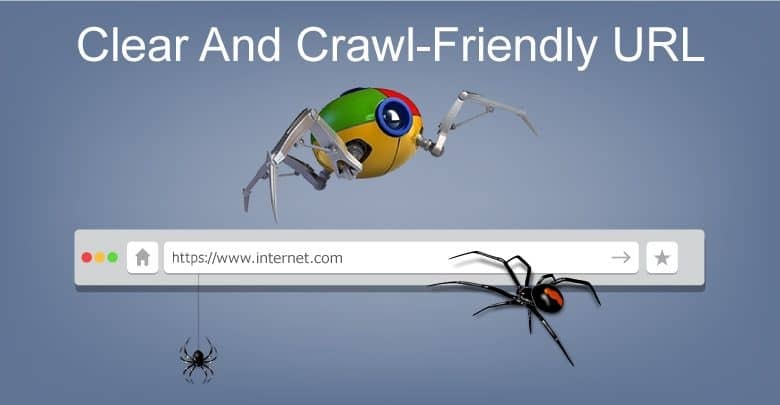 Crawl- Friendly URLs helps search engine crawlers affectively and adjust your rankings. A URL (Uniform Resource Locator), also known as a web address, indicates the location of a website or page in the online environment. It also shows how the resource can be retrieved through various protocols: HTTPS, HTTP, FTP, etc. The URL contains a protocol, a domain name, and a path. The latter is a roadmap to a certain page on the site. It’s very important to choose top level domain names (TLDs), meaning “.com” instead of “.pro”, “.biz” and “.net”. TLDs improve the trustworthiness of your site and, in turn, have a positive outcome on your SEO. HTTPS (HyperText Transfer Protocol Secure) protocol is recommended instead of HTTP (HyperText Transfer Protocol) because it makes your website more secure. Considering the large amount of cybercrime in this day and age, you’re better off with an encrypted website. Not only does HTTPS provide security to your visitors and your website, but it’s become a ranking signal for search engines. Make sure to add an SSL certificate to your website, especially if you’re an e-commerce business. Shorter URLs offer higher rankings in the SERPs. Google positions shorter URLs, with a max of about 50 characters, towards the top of the page. URLs with 60 characters or more drop lower down the page. Whatever you do, don’t exceed 80 characters. Google tends to position long URLs lower because if you have too many keywords in your URL, the search engine thinks that your content is limited to the combination of all those keywords, making it too specific. A shorter URL indicates your content is broader and Google will perceive it as being more helpful to users, thereby positioning it higher. Subfolders and subdomains should be well-structured and readable. Use keywords for subfolders’ names to help your users navigate the site and ensure indexing by search engines. The shorter the depth of your site, the better. Subdomains are usually approached as separate domains and will double your SEO efforts. However, for non-related products, it’s a better idea to use subdomains for clarity’s sake. Even Google does it, like maps.google.com for maps and news.google.com for news. Your domain name should be easy to remember and not contain keywords that exactly match search queries. In fact, you’re probably better off avoiding keywords altogether and opting for a brandable name. You can use keywords in the titles of your posts, meaning they will still show up in the URL. A brandable domain name is smarter, though, because it shortens the URL and also makes it memorable to your audience, which is essential. Maximum readability and relevance are gold when it comes to URLs, which should provide both search engines and humans with a clear understanding of the destination page’s content. To space out words in the URL, use hyphens and avoid underscores. Also, avoid any weird characters. Stick to letters and numbers so that your audience can understand immediately what the page is about, even from your URL. Also, always use lowercase letters because uppercase forms can lead to 404 errors or redirects. Stop words (“a”, “an”, “but”, “or”) are just fillers and should be avoided. Well-designed and properly constructed URLs can be used as anchor text themselves when copied and inserted as links into forums, blogs, social media networks etc. Unoptimized URLs tend to redirect any potential prospect away from the link, and you lose organic traffic. If you want to see your search engine rankings improve, make sure to clean up your URLs as quickly as possible.